Ponds and waterfalls are a great addition to your Southern California property. The peaceful sounds of rushing water coupled with the beauty of natural plant life transport you right into nature without ever leaving your home. However, not everyone wants a large pond or waterfall in their backyard. Maybe you’re afraid of how much maintenance it requires or you have small children and are worried about the safety risks. If you’re hesitant about installing traditional waterfalls or a pond in your backyard, pondless water features are a great alternative. What are Pondless Water Features? A pondless water feature is essentially a recirculating waterfall and/or stream without the presence of a pond. Pondless water features have an underground basin that catches the water and then it recirculates back to the top. All of the beauty of a waterfall is there, only it doesn’t have the typical 12” – 18” deep pond. A pondless feature will only have water that is 2”-3” in depth, visible above the surface. Low maintenance water features such as these are a great choice for busy Southern California homeowners who love the idea of a waterfall in their backyard but aren’t sure about installing a full pond or don’t have time for the maintenance of a fish pond. All bodies of water require some level of maintenance, but you’ll spend substantially less time on maintenance tasks for a pondless water feature. While a regular fish pond requires at least 10 minutes of maintenance per week, pondless water features require approximately one hour per year. This involves cleaning out the Biofalls once a year, and on occasion, removing leaves from the basin. There are many different types of water features, and they can be as simple or as grand as you’d like. This allows you to get creative and design a water feature that’s unique to your property. Sometimes, pondless waterfall construction is taken on by homeowners as a do-it-yourself project. And while there are plenty of pondless waterfall kits available online, many things that can go wrong when building a pondless waterfall on your own. In many cases, it’s worthwhile to let a professional handle the design and construction for you. Professional contractors have the experience necessary to design a pondless water feature that fits your style and property. They can make it look natural so it perfectly blends into the surroundings, and a professional knows how to choose the best rocks and properly set them. Plus, they’ll be able to guide you in the right direction when choosing plants to help complete the overall look. Pondless waterfalls can take quite a bit of time to install if you’re doing it on your own, and it’s likely that you’ll need to enlist the help of a few friends and even a large piece of equipment, since some of the materials are heavy. In most cases, a professional can install a pondless water feature in one day and may only need to come back a second day to finish up some additional enhancements. Using a pro saves you a significant amount of time, allows you to enjoy your water feature sooner, and to have the peace of mind that the work carries some sort of guarantee. 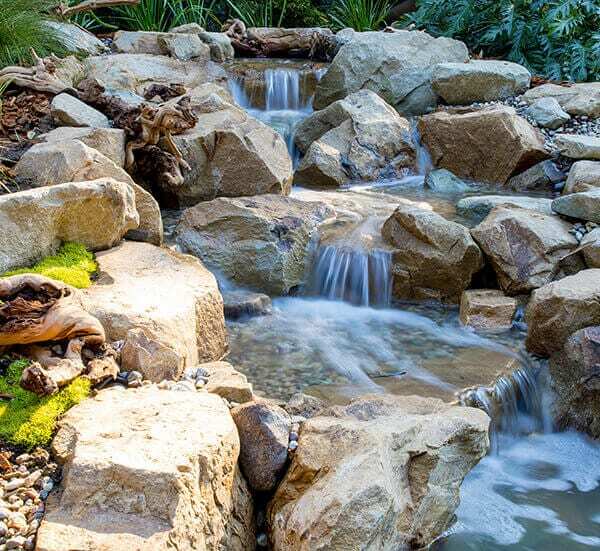 If you’re thinking about adding a pondless waterfall to your Southern California property, the team at California Waterscapes can help. Whether you’re looking for a simple stream or a large, extravagant cascading waterfall, we’ll answer any questions that you have and work with you to design and install a low maintenance water feature that fits your style, property, and budget. Want to Learn More About Pondless Water Features? At California Waterscapes, we offer design and installation services for ponds, other water features, and pondless waterfalls. To learn more about how we can help you with your next pond project, check out our gallery and contact us today for a free quote.